This is the 65th meeting between Heritage Hills and Southridge in high school basketball and the Raiders lead the series 33-31. This is a huge game in the PAC as the winner will be the last team without a loss in conference play. HH and SR have won more Boys PAC basketball titles then any other school with the Patriots leading with 15 and Southridge 2nd with 14. According to Sagarin HH is ranked 9th in 3A and Southridge 19th in 3A the Patriots are also ranked 7th in the AP poll. Raiders have the 146th ranked schedule and Patriots 234th ranked schedule according to Sagarin. Patriots are averaging 69.0 points per game and giving up 46.6 points per game and Raiders are averaging 53.8 points per game and giving up 43.7 points per game. Heritage Hills is led in scoring by Becher 20.7, Scherry 15.5, Sisley 13.0 , Sigler 7.7 and 6th man Begle 4.7 points per game. Southridge is led in scoring by Montgomery 18.5, Hayes 13.9, LaGrange 10.8, Voegerl 3.5 and Price 3.3 points per game. HH’s SOS is hurt dramatically by the fact that far & away their best opponent to date was Madison Central, Ky. Sagarin cannot figure an out of state team into his rankings. It’s essentially as if the game wasn’t even played. Their SOS should rise quite a bit as the season goes on. The Patriots still have Southridge, Mater Dei, Jasper, Forest Park, Tell City & Princeton left. HH will look to get up and down the floor on offense, while SR will not be afraid to run, but would prefer to slow it down and make HH run a set offense. SR plays great D, and will hopefully slow down the Pats. My heart says Raiders pull the upset, my head says Pats by 7. I think HH's big 3 > SR's big 3. That'll give them the win. I took Southridge in the pickem game on the other site, mostly because coach Rohrer has a history of winning big game match ups like this and frankly HH has a history of losing them. I was really worried about this game especially after I heard from 3 different people this morning that 2 of our 3 leading scorers were sick this past week but since the big 3 combined for 60 points they must have been just fine. Heritage Hills finally got that statement road win that the program needed so badly. Anyway to the game. Game was tied 16-16 after 1 quarter, At halftime it was Heritage Hills 33 Southridge 26, After 3 Heritage Hills 47 Southridge 40 and final Heritage Hills 64 Southridge 52. Heritage Hills improves to 14-1, Southridge falls to 9-5. JV score Heritage Hills 48 Southridge 41 , Patriot JV improves to 10-1. Patriots had two starters leave game with injury's one Jones didn't return and the other Sigler returned late in the 4th. 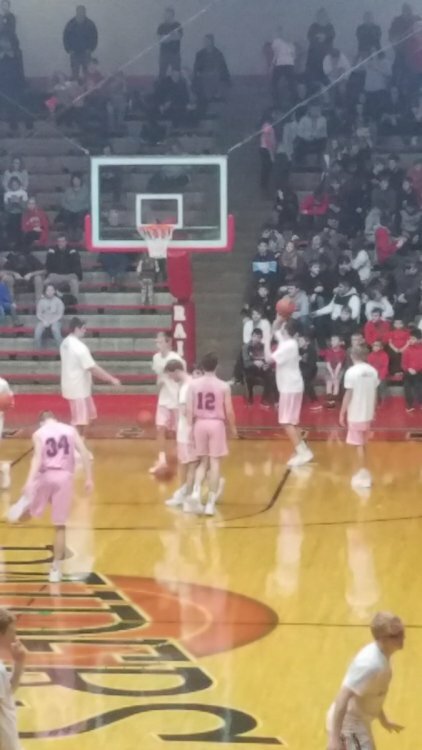 Special pink coaches vs Cancer uniforms the Patriots wore tonight. That is a really nice win. Congrats to the Patriots. The PINK uniforms needs to replace the red.